CANADIAN DEFENCE MATTERS: AN ADVANCED NAVAL BOARDING PARTY, THE MARINE COMMANDO REGIMENT BY ANOTHER NAME? AN ADVANCED NAVAL BOARDING PARTY, THE MARINE COMMANDO REGIMENT BY ANOTHER NAME? Canada does not have a Marine Corps. It does not, like Australia for example, have Army units that are preferentially tasked to conduct amphibious operations. Even though we have a competent navy and real maritime interests Canada has limited amphibious capabilities. It is not that there are no precedents in Canadian military history for amphibious actions. In 1884 Garnet Wolseley, who had commanded the Anglo-Canadian force which put down the 1870 Red River Rebellion, was in command of a rescue expedition to relieve General Charles Gordon who had been sent to the Sudan to rescue Egyptian garrisons cut off by a Muslim uprising led by the Mahdi, but had become trapped in the capital, Khartoum. Wolseley decided that the best way of reaching Khartoum would be to ascend the Nile River. Based on his favourable experience with them during his expedition along the Red River in 1869–1870 to suppress the Red River Rebellion, Wolseley asked the Governor General of Canada if it would be possible to recruit a contingent of Canadian voyageurs to help him navigate the Nile. The Prime Minister, Sir John A. MacDonald, did not object once he was assured that the voyageurs were volunteers and would be paid by the British. Only 24 days after the request was received, 386 voyageurs set sail for Egypt. The Canadian Army did participate in a number of amphibious operations in World War II, most famously the Dieppe Raid, but since then the Canadian Forces have managed to get along without any discernible naval infantry capability. A Standing Contingency Task Force (SCTF) of air, land and sea forces. For a brief period in the 2005-2007 time frame, the Canadian government talked about establishing a Standing Contingency Task Force (SCTF) which would have implied the creation of a Naval Infantry unit. In its Defence Policy Statement (DPS) of April 2005, the government announced a shift in the political direction that guided the Department of National Defence and the Canadian Forces. Although the DPS did not say so explicitly, it was clear from comments made by the Minister of National Defence and the Chief of the Defence Staff, that the SCTF would have an amphibious capability. At that time the suggestion was that a Canadian Marine Commando Regiment (MCR) would be formed. It was speculated that the unit would be based at Canadian Forces Base Comox, and have an initial strength of approximately 250 members. 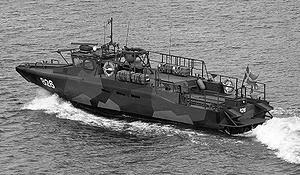 In the end, faced with mounting pressures from the Afghanistan mission as well as its upcoming role in providing security for the 2010 Olympics in Vancouver, the development of a standing contingency force, an amphibious unit designed to intervene in the world's hotspots, was put on hold and then quietly dropped. Or so it would seem. An Advanced Naval Boarding Party (ANBP) capability. Right now, naval boarding parties are comprised of regular members from a ship’s company who perform these duties in addition to their primary duty on board. Once fully operational, it is intended that the new unit will deploy specialized teams on any RCN platform operating in a high-risk environment. The unit will eventually be comprised of approximately 70-100 members from across the RCN, including both Regular and Reserve Force. A traditional Naval Boarding Party is capable of conducting basic obstructed boardings. It is expected that the ANBP capability will allow for deployed vessels to meet the higher levels of risk now being encountered and to provide other direct support when necessary. There is in Canadian military history a precedent for the kind of Marine infantry now being organized at CFB Esquimalt. In 1627 Cardinal Richelieu, at that time the first minister of France, founded the Régiment de la Marine. It was to provide onboard troops capable of fighting on land or on sea, and commanded by the officers of the ship. The Fusiliers-Marins are the direct successors of the Regiment de la Marine. In the current age the Fusiliers Marins ("Naval Fusiliers") consist of about 1,900 men specialized in and tasked with the protection of sensitive sites of the Navy, protection of ships, onboard security, mentoring boarding-landing parties, military instruction in French navy ships or schools, and the reinforcement of the protection of any particular building, place, or ship supporting operations of the Navy. The Fusiliers Marins may not be the right model for creating a modest Canadian amphibious capability, but there is little doubt the Armed Forces sees the need for such a unit. Continued exercises with allies and with what organic capabilities are available suggest that such a unit is needed. It has been pointed out that a Marine Commando Regiment, by any name, would be a positive development for Canada’s maritime forces. It could provide a maritime counter-terrorist force and an evacuation capability. A unit dedicated to the maritime environment, one with units available on both the Atlantic and Pacific coasts, and properly equipped, would serve the long-term interests of Canada and her maritime forces.